Unleash MyCallBot's enormous directory of collection agencies, telemarketers, etc. on your Android mobile device. MyCallBot goes to work when an incoming call is received that is not already in your contacts list. If a profile is available for the phone number then an informative caller ID notification is displayed citing location, statistics, and tags. The application also provides a call log of unknown callers for convenient access to additional information online. 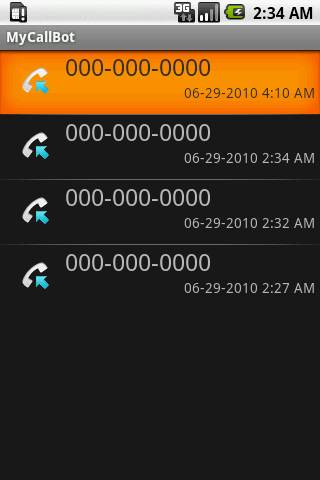 MyCallBot's caller ID notification makes it possible to evaluate a caller before answering. Avoid or speak to debt collectors, telemarketers, politicians, surveyors, etc. on your terms. 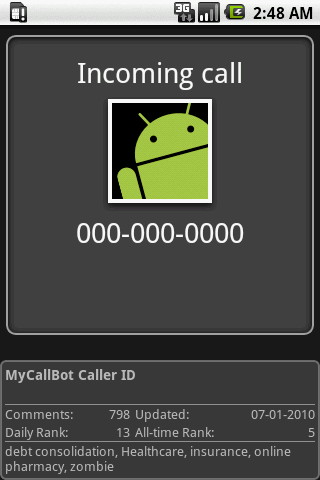 MyCallBot is available for Android 1.5+ devices with a data plan. Data transfer for lookups is minimal, generally less than 1 kilobyte. Users receiving calls in or from North America will realize the most benefit.